Z5321-PED Faucet Mount: Single Hole Features: -Bathroom sink. -Wall-hung. -Rear overflow for use with concealed arm carrier systems and half pedestal. -ADA Compliant. Installation Type: -Wall mount sink. Style: -Traditional. Sink Shape: -Rectangular. Finish: -White. Hardware Finish: -Stainless steel. Material: -Ceramic. Overflow: -Yes. Commercial Use: -Yes. Faucet Mount 4" Centers - Number of Faucet Holes: -3. Faucet Mount 8" Centers - Number of Faucet Holes: -3. Faucet Mount Single Hole - Number of Faucet Holes: -1. Dimensions: Overall Length - Side to Side: -20.25". Overall Width - Front to Back: -22.875". Overall Depth - Top to Bottom: -21.75". 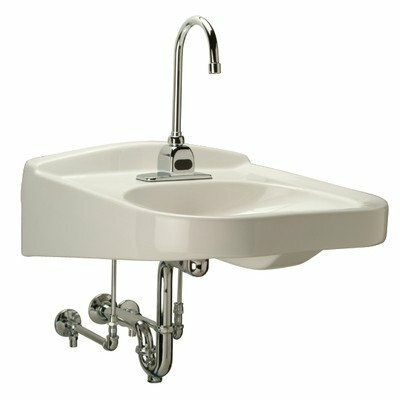 Basin Length - Side to Side: -16". Basin Width - Front to Back: -12.938". Basin Depth - Top to Bottom: -5.9". Overall Product Weight: -27 lbs. ASI 3700-01-36P Peened Straight Grab Bar with Snap-On Flange Covers, 1-1/4" Diameter, 36"